It’s always an interesting thing to see a show continue to grow and feel comfortable branching out from the story it started out with. 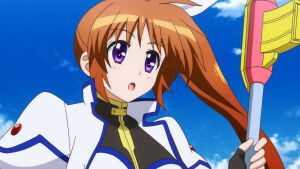 Mahou Shoujo Lyrical Nanoha ViVid is certainly a direct sequel from the original trilogy of Nanoha anime series. An adaptation of a manga that decides to follow the story not of the original main character, but rather her adoptive daughter Vivio. The series represents both a continuation of the story of this universe, but also a fresh start for people and a chance to follow the exploits of a new main character. 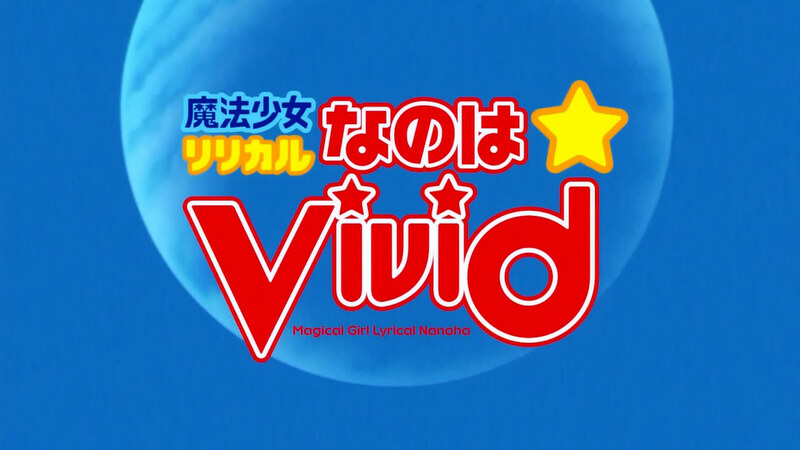 On that front Vivid has had a pretty good start, trying to walk the line of being a sequel but also a point where people who don’t know about the original series can still jump on board. 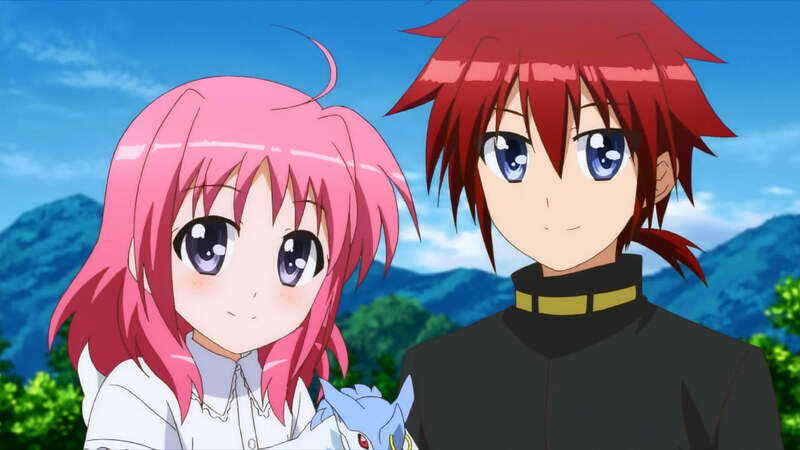 As someone who enjoyed the other anime in the series this has been an enjoyable ride. 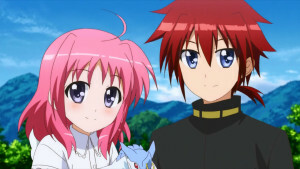 Like any series it won’t appeal to everyone, but it’s done a good job keeping me interested in where things are going. 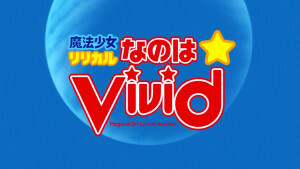 The tough thing for Vivid in the early going has been the fact that it does end up a more fulfilling experience if you’ve seen the original series. Some references to the previous shows and even some of the sound stages. 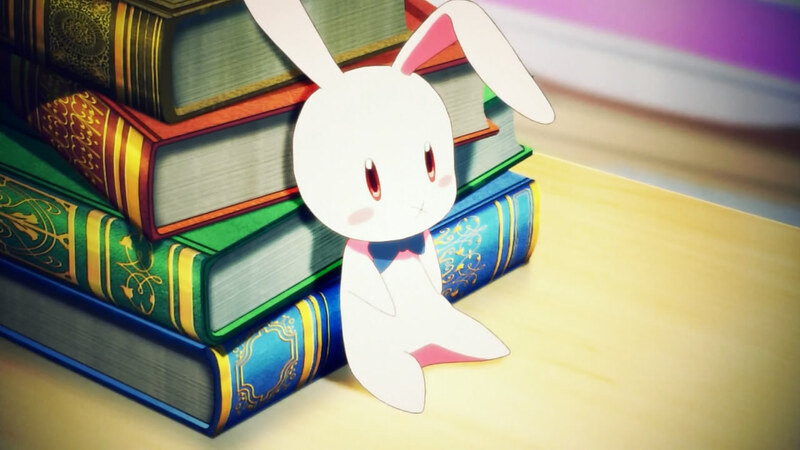 For better or worse the show isn’t going to an extreme level to catch everyone up, but let them take the story that they currently are being given or look up the previous materials. While the show isn’t going to be winning any prizes for animation, it’s doing well enough. 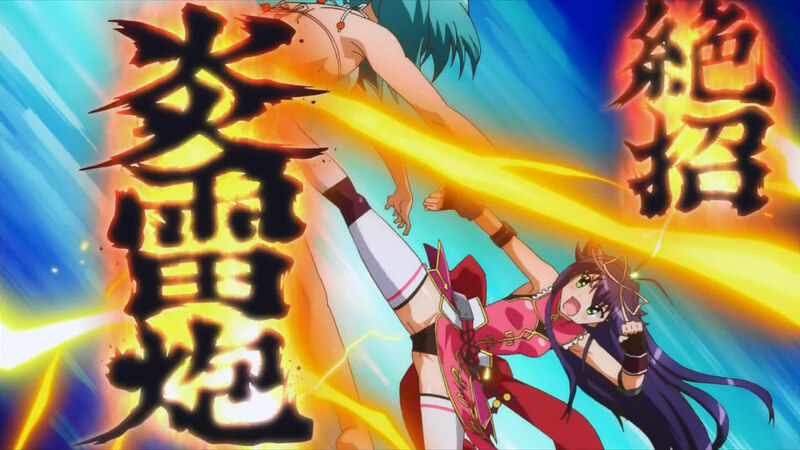 It’s a different feel and style than even the latest anime StrikerS had. They are still putting in the effort though for the magical blasts and quick combat. The latest episode being the best example of the effort they’ve been putting into it. 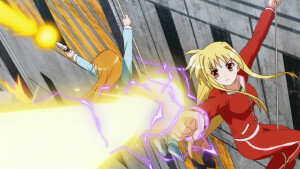 Especially in the last episode the show has had to tackle characters who have very different styles of fighting and abilities. From pure shooters, to melee weapons, to hand to hand combat, to golems! 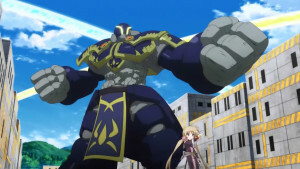 The show has done a solid job making those abilities feel more than powerful enough while not breaking the budget to animate what could be pretty over the top spectacular attacks. I would just like it ideally if the overall animation and visuals were stronger. In terms of the action the show has had a pretty good start. We’ve had a handful of small fights and then the last episode which was a total brawl. 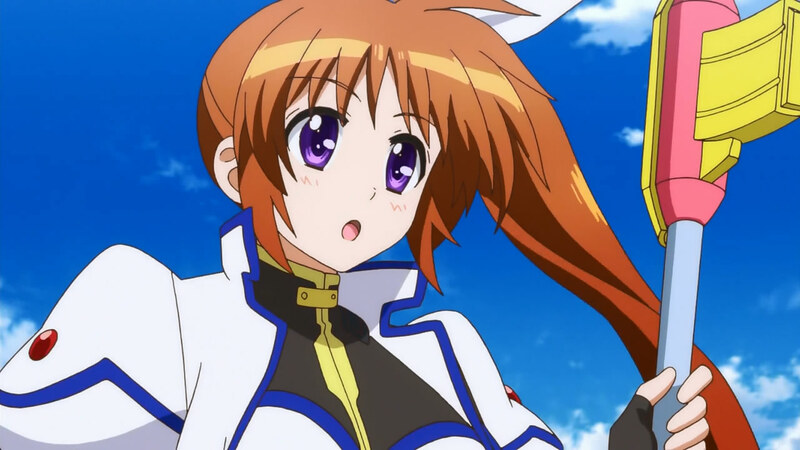 Action is just part of the Nanoha formula so nothing unusual there. 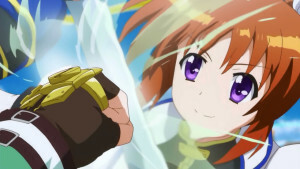 While I don’t expect the old cast to remain overly active in the story for long, I think the new characters have enough interesting abilities that it will still be plenty entertaining. 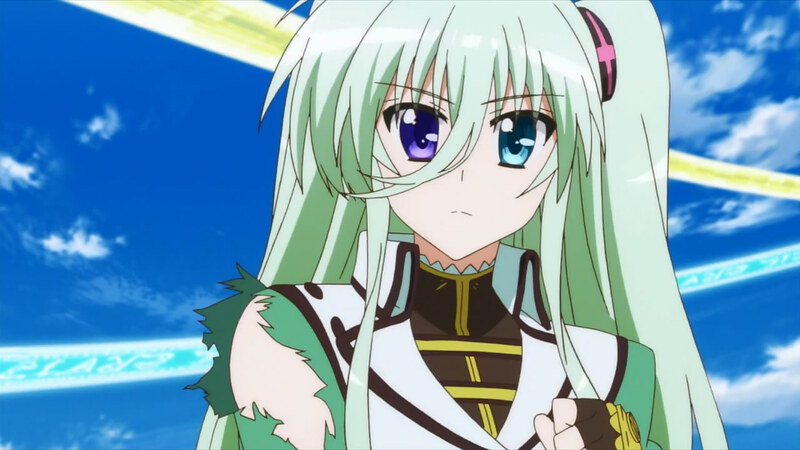 Vivio and Einhart are good pure fighters and if we keep seeing them match up in fights that will be fun. Corona brings a very interesting golem creation magic to the table and Rio has a great combination of abilities which makes her one of the most fun to watch in action XD. The key to the show is going to be the new cast. 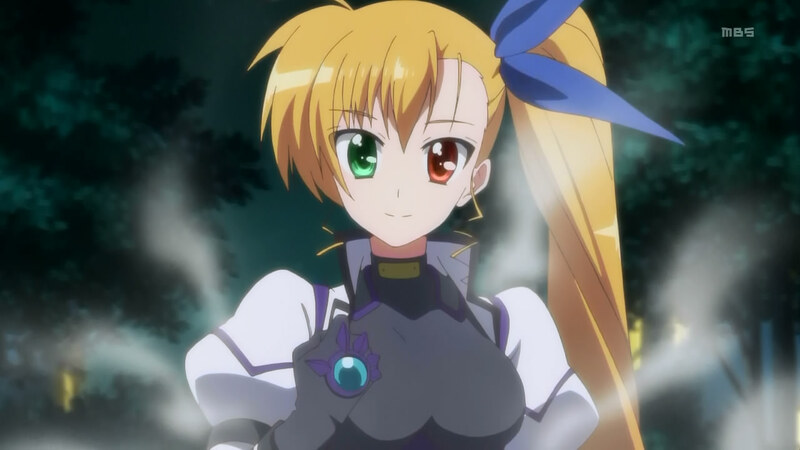 Vivio is a pretty likable lead and she is a great inheritor of the main character role from Nanoha. They are very similar in certain ways, both of them being very positive and straight forward personalities. Vivio has a bit more emotional baggage because of her past than Nanoha had growing up, but it’s still a fair comparison. Vivio has a big heart and her style of being a counter attacker should make her future fights entertaining. 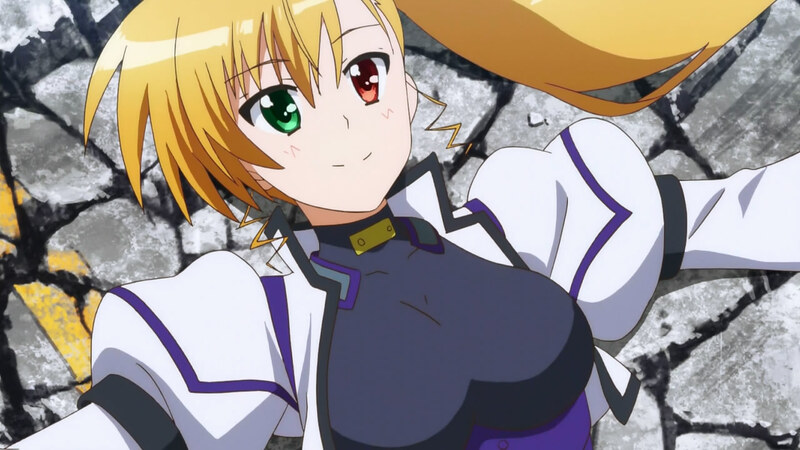 It’s not just a question of bringing Vivio down, but doing so while avoiding her taking you down in the process. Einhart is the obvious Fate replacement for this story. I think she’s probably more suited to it than the attempt that was made with Lutecia in StrikerS. She’s a girl with a lot of weight on her shoulders because of the memories she has inherited from her ancestor. In a sense she is very much a natural born Project F character. The interesting thing with Einhart will be allowing her to grow while not simply dismissing the past memories that are so important to her character. 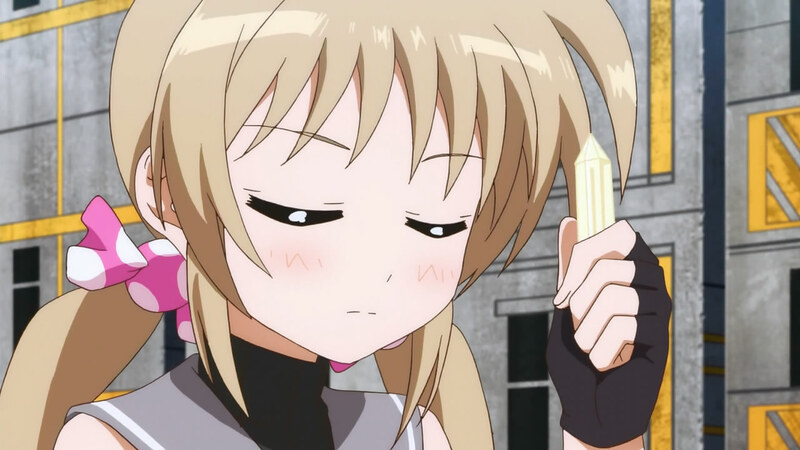 Right now she serves as a wall for Vivio to try and overcome. 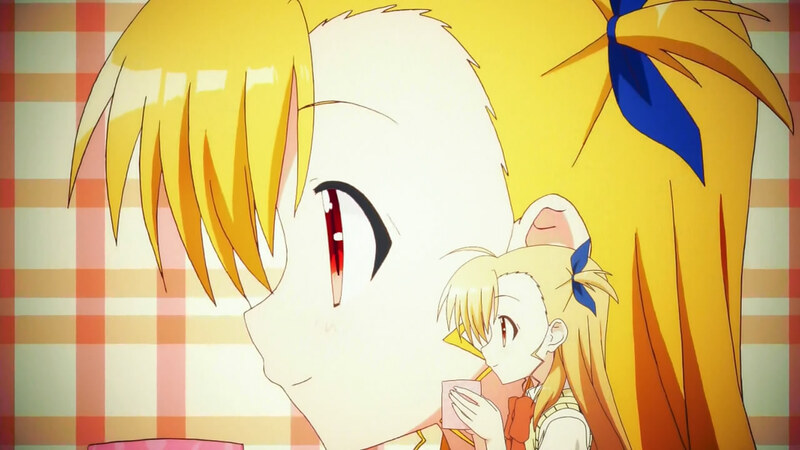 Though I don’t think the gap is all that large and Vivio can certainly close it. 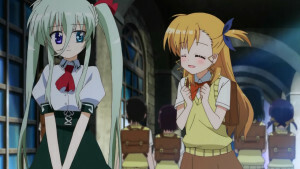 Unlike the original series they are giving Vivio some additional friends that can join in the action. Corona and Rio aren’t like Nanoha’s old friends, they can go to school with Vivio and also hold their own in a fight. Corona has one interesting magic style that will be fun to see more of. 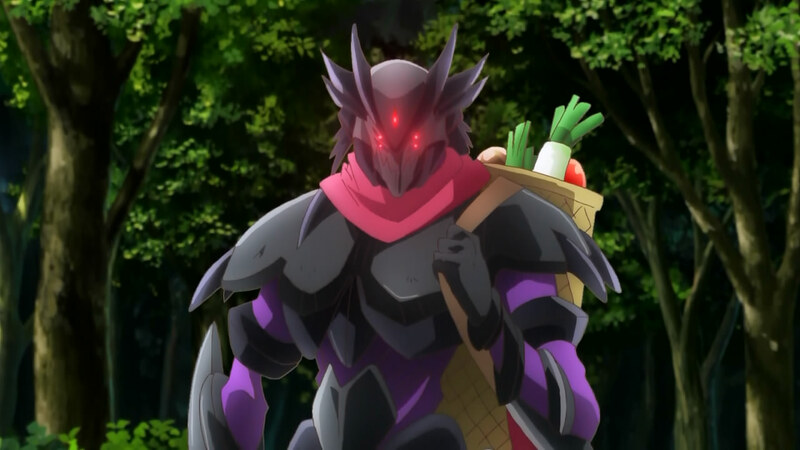 We’ve seen summoners and pure shooters in this series, but here we get someone who can basically create a mech. Creating a golem that she can manipulate and control as a weapon. You can see where her growth can end up from this starting point. Either to the level where she can fight well enough that it will be tough to get past her golem and overpower her. Or can go to the other level of basically creating a cockpit and rest safely while the golem takes out the threats XD. Corona seems like a nice character, just need to get her more focus later on. 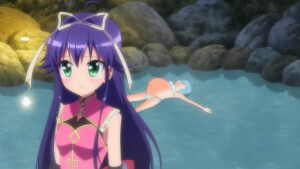 Rio may be the most entertaining of the new cast for a variety of reasons. 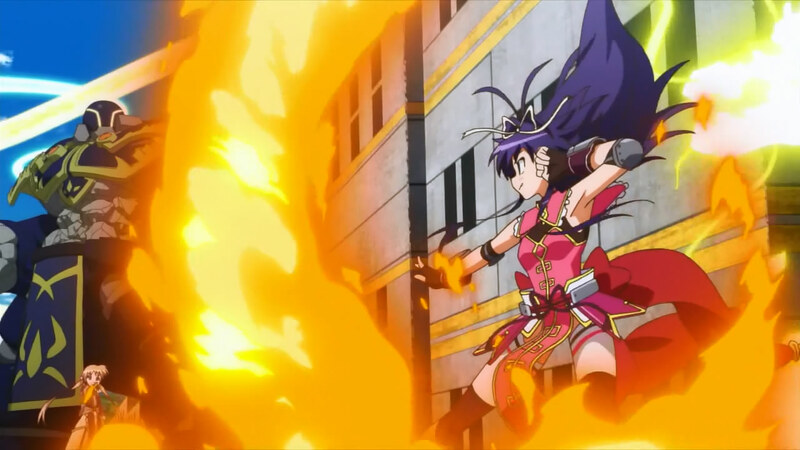 Her abilities are just some of the most awesome we’ve seen in a while. She has both fire and lightning magic with a dragon twist on them, she’s physically powerful (she tossed a golem after all), and she’s got speed. 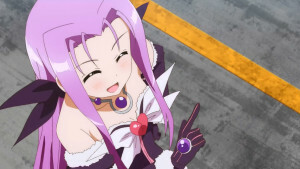 That magic makes Rio a very powerful all rounder type. A tough one to take down and overpower. She’s a pretty energetic and confident character so it will be easy to avoid getting bored with her in the show. 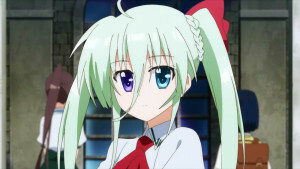 So far the story has been mostly about bringing Einhart into Vivio’s group of friends and establishing the story. 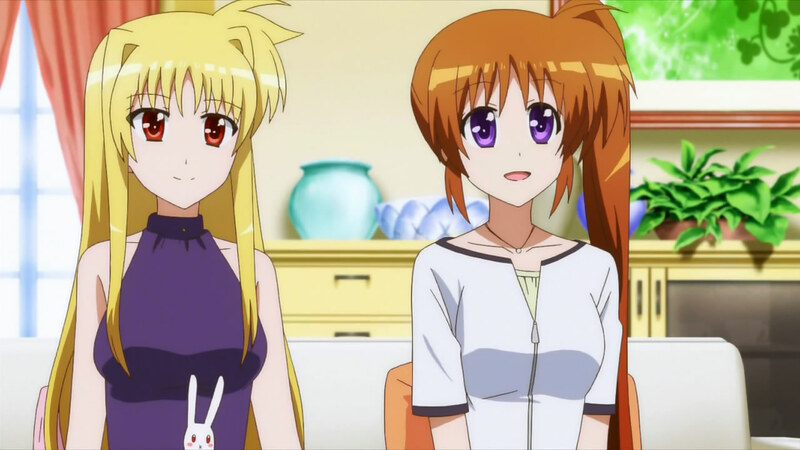 They’ve made heavy use of the original cast early on because these people have both authority in various positions and are experienced enough to guide someone like Einhart onto the proper path. 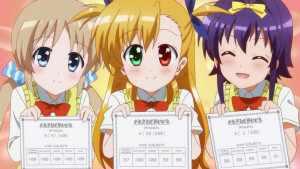 It’s been an interesting move turning Nove (the resident hot head of the Numbers) into the coach for Vivio and her friends. In some ways it feels like the start of a sports series where the girls are going to learn how to use their magic and compete against their peers. A pretty different setup from the previous series which were more about taking on a much more life threatening danger. The show also deviates from the norm in the sense that it’s an adaptation of a manga and not an original story. 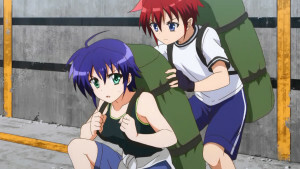 The pacing and length of the story could get interesting since unlike the previous shows it isn’t likely to be fully wrapped up within a season or two. This really is something different from the original series and could be an interesting way to pass the torch of the Nanoha franchise onto a new main character and to a new group of fans. While it will help a lot to have seen the original shows, if you feel comfortable with not knowing a few reference it will be fine. The music works really well in the action sequences and the voice work fits well with each character with almost everyone returning to their roles. There is also a lot of solid sound effects in this show which is pretty important when you have so much action. I’d say the OP for this series has been pretty solid. 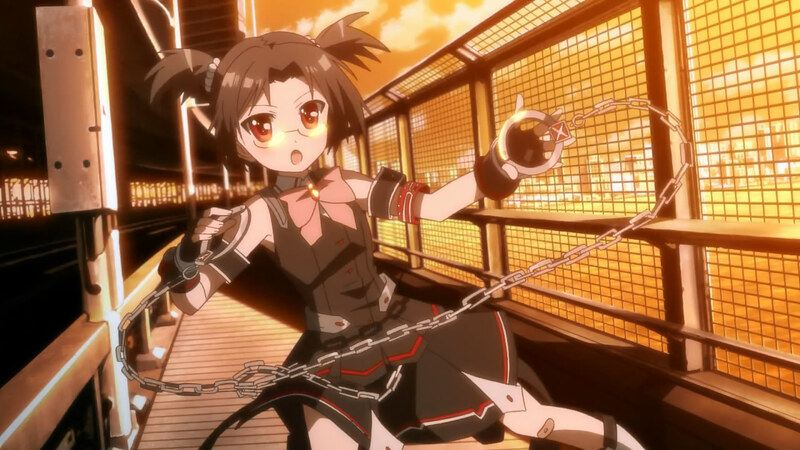 It’s a very familiar style and song for the series. 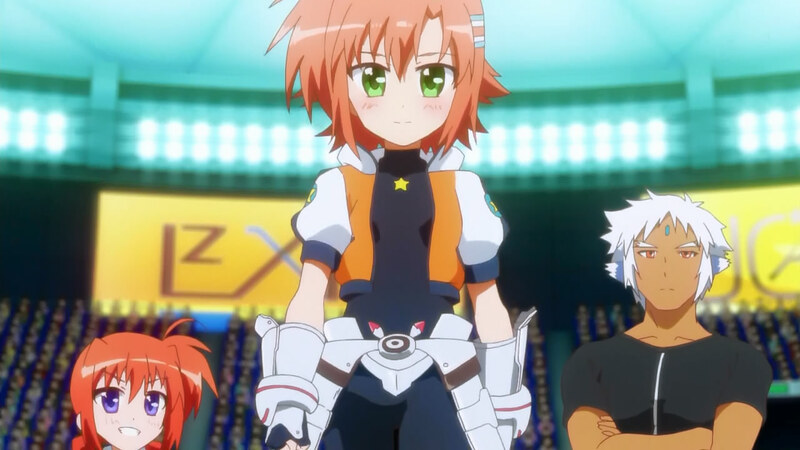 It does a good job keeping the focus on the new cast and Vivio with only a small look at the older characters like Nanoha and Fate. The visuals are very in line with the series as a whole. It’s not my favorite song or OP of the season, but I don’t dislike it either. The ED is also pretty simple, just going for a pretty cute song and look. The focus is kept pretty firmly on Vivio with some secondary focus on Einhart. The show is making sure to keep it obvious that this friendship and bond will be a central part of the series. Again it’s not a bad ED by any stretch and has a fair amount of movement and animation in it. The song is nice as well. 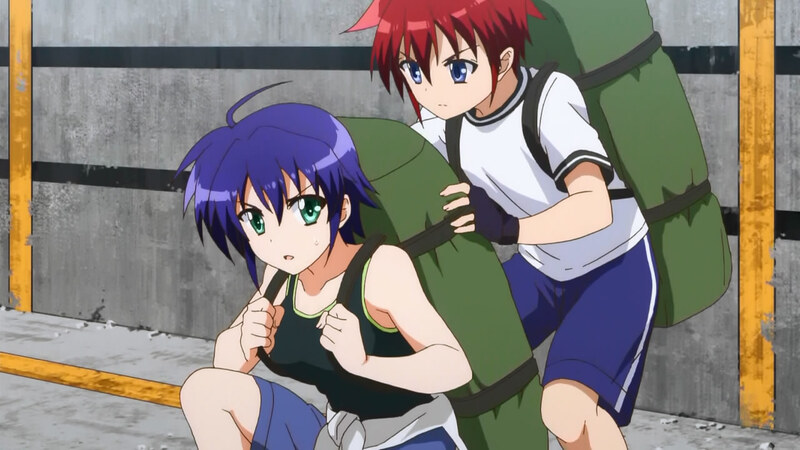 Not my favorite ED of the season, but it’s ok. I’d consider it average if nothing else. Obviously if one does not care for the genre itself, I doubt this show will change anyone’s mind. But, I do think this is a show worth giving a look if there is any interest at all. Some fun magic, a good mix of returning characters and new ones, and the potential to be a fun series. It’s in an interesting position as both a sequel, but also a fresh start to the show. I’m not sure how people will respond to this approach, but for me who has followed this show from the first season until now it has worked well. If nothing else, it is a show I have enjoyed watching and hope others will as well.